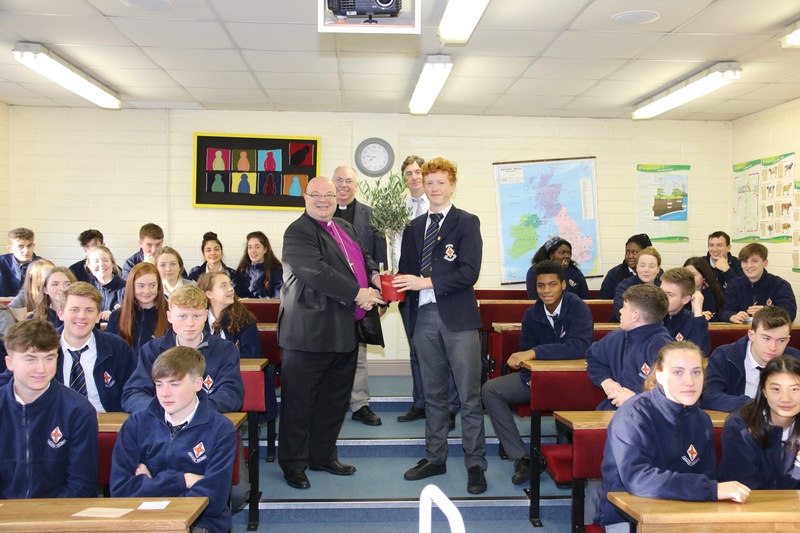 Following up on an idea given to him by Eunice Jeffers, in Dunmanway, the Bishop of Cork, Dr Paul Colton, decided to present each school in the Diocese with an olive tree – a symbol of peace and reconciliation. These are to be the centrepiece of special school assemblies being held in every school today to mark the centenary of the First World War. The trees were specially imported and were distributed throughout the Diocese earlier this week. Bishop Colton himself delivered the trees to each of the three second level schools in the Diocese on Tuesday and Wednesday this week and spoke with the students about the continuing significance and impact for us all of the First World War one hundred years on. A tree is presented at Bandon Grammar School at an assembly arranged by the Chaplain, the Reverend Anne Skuse (left). 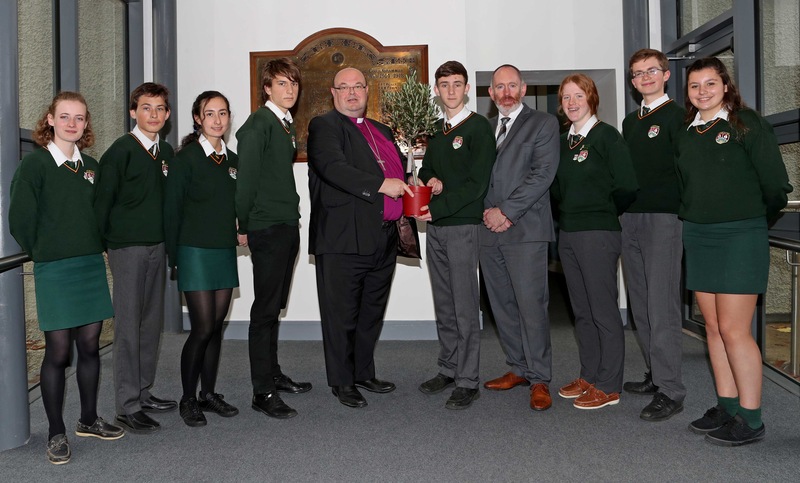 Sixth years at Midleton College receive the olive tree from the Bishop, watched by school chaplain, the Reverend Andrew Orr (back left) and history teacher, Christopher Baker. 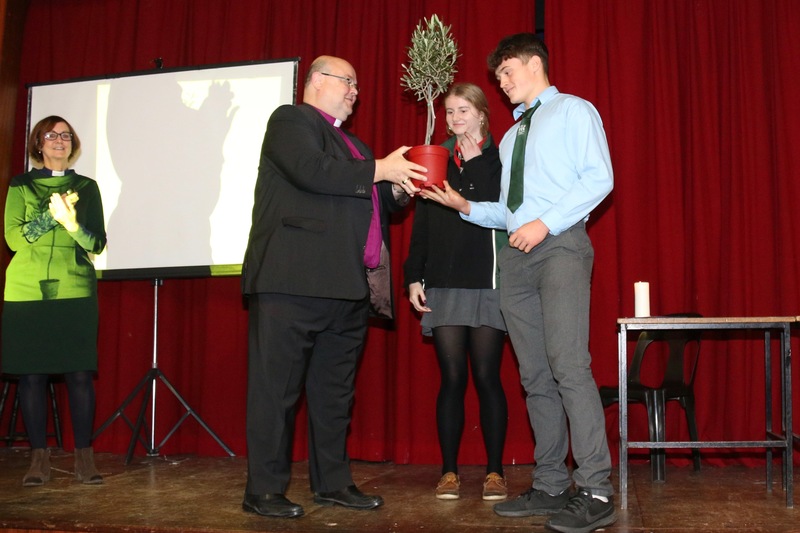 Bishop Paul Colton, presents an Olive Tree at Ashton School, the traditional Symbol of Peace, accepted on behalf of the school by, Kyle Meiklejohn, also included are, Alison Warren-Perry, Brandon Beare-Maythan, Maeve Herlihy, Aron O’Connell, Adrian Landen, Principal, Ellie O’Meara, Luke McCormack and Claire Jermyn. In the background is the school war memorial listing the names of 53 pupils and past-pupils of the school who died in the First World War. This entry was posted in Anniversaries, Ashton School, Bandon Grammar School, Bishop, Centenaries in Ireland, Centenary, Chaplaincies, Community Involvement, Contemporary Issues, Education, Five Marks of Mission, Schools in the Diocese. Bookmark the permalink.